An interesting thing about exercises is that some of them are born from everyday situations. It is not like two bodybuilders are sitting in the gym and try to think of new exercises, but the fact that a malfunctioned car in the middle of nowhere can be a creator of a great workout exercise. Almost every driver has found himself in a position to push the car to the next gas station or service lot. The effort of moving the car’s 4 wheels created a perfect cardio exercise capable of strengthening the upper and lower body. 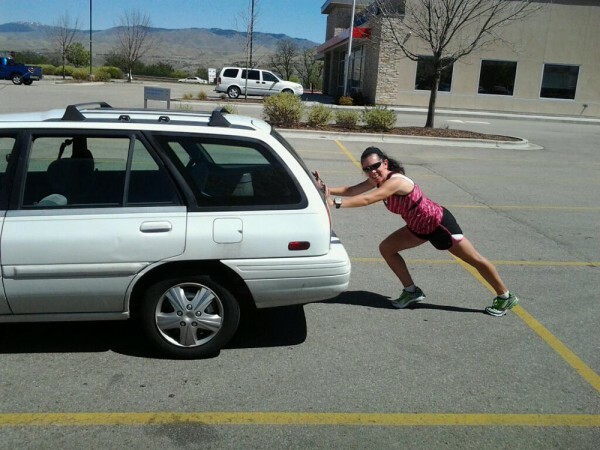 Car pushes are considered to be one of the most effective cardio workouts. It is a movement that combines pressing power from the upper body with leg pressing for the lower body. When you run out of fuel, either you call a tow- company to tow the car to the next petrol station, or you push the car yourself. Now, if the road is quite straight and with no slopes, than pushing the car can be beneficial to the body. Using the upper body to push and the lower body to press down on the road trigger nearly every muscle in the body. Now the most used muscle groups in this process are the chest, that is if you push with bended elbows. The lower body mostly uses the calves and buttocks. If you feel embarrassed to pushing a car around the block (even though the car has no problems) you can simulate the push by placing several weights on a specially designed metal rack. Some gyms have big parking lots, and it is no surprise to find bodybuilders there exercising car pushes. Perform this exercise with 3-4 sets with 30 seconds of pushing per set. There is a difference from car to car. If you choose to push a car on the road for exercising, make sure you choose the car wisely. There is no point in pushing a small car if you are a veteran in weightlifting. Beginners should also try not to overreact in their chose of cars.